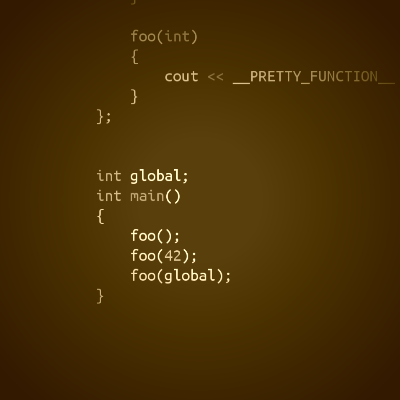 The line foo(global); doesn’t cause the foo::foo(int) constructor to run, instead causing the default one to be executed. Why is that? An expression-statement with a function-style explicit type conversion ([expr.type.conv]) as its leftmost subexpression can be indistinguishable from a declaration where the first declarator starts with a (. In those cases the statement is a declaration. This is exactly the same principle that allows the Most Vexing Parse to exist, and that drove the standards committee to design mostly uniform initialiation added in C++11 (and made even less uniform in C++17). In this case, it meant that foo(global); declared a new local variable called global, shadowing the global global variable. The parentheses here were entirely optional and the meaning of this declaration was identical to foo global;. foo global; // the same thing! That is also the reason why the default constructor was executed. © 2019 /dev/krzaq | Theme: Storto by CrestaProject WordPress Themes. Modified by KrzaQ. | 7 queries, 0.252 seconds.